Plum Creek, built to look like a big red barn, took six years to design, opening in September of 1994. The design provides for both patient and human comfort, as well as disease control. In 1998, we received the prestigious Veterinary Economics Merit Award for hospital design. Dr. Morris was lucky enough to be chosen to share her love of our profession in a careers article in USA Today. Unlike human medical facilities with strict requirements for record-keeping, cleanliness and patient care there are no required standards for veterinary clinics or hospitals. 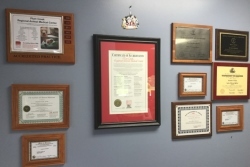 We voluntarily uphold the high standards of the American Animal Hospital Association and pride ourselves in having been granted certification, an honor few animal hospitals or clinics share. Established in 1933, the American Animal Hospital Association is well known among veterinarians and pet owners for its high standards for hospitals and pet health care. 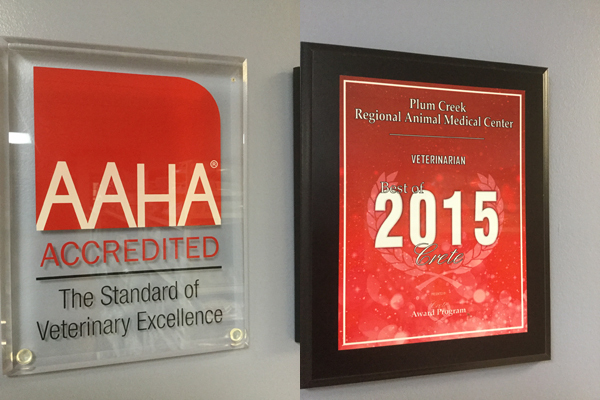 Only about 12% of veterinary hospitals voluntarily participate in the AAHA hospital evaluation program. Trained consultants regularly visit these hospitals to ensure compliance with AAHA's standards for services and facilities. Having added additional doctors in the summer of 2001 and 2009, we continue expanding our services and expertise. In 2010, we decided to help and give back to our community by opening Pet Vet in Dyer, Indiana. Pet Vet in Dyer is a well-established small animal veterinary clinic providing low cost outpatient care, vaccines, blood and urine testing and examination and treatment of minor problems. With so many people seeking affordable pet care, Pet Vet helps provide pet care when the services and facilities of a full service hospital are not needed, although the central hospital, Plum Creek is just 7 miles away. It has now been 40 years and to celebrate with Dr. Morris we had a gathering and a great time!